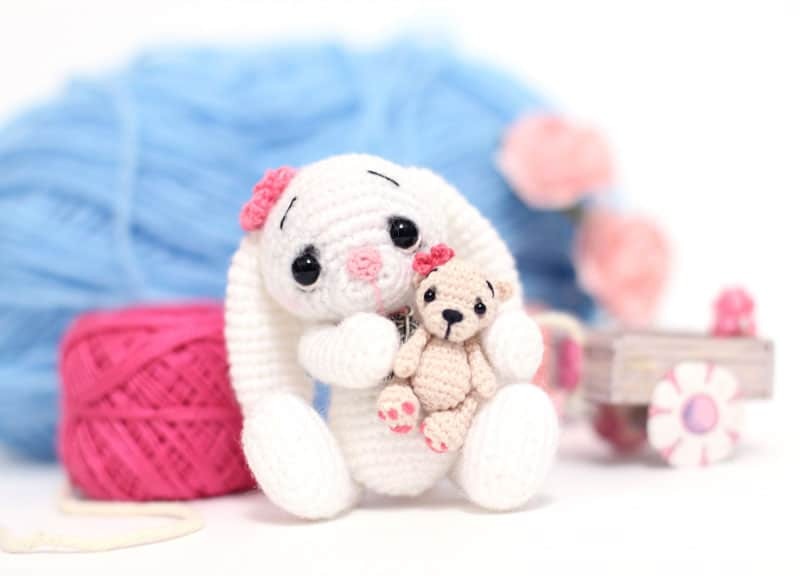 Create your own little crochet bunny using this easy free amigurumi pattern! 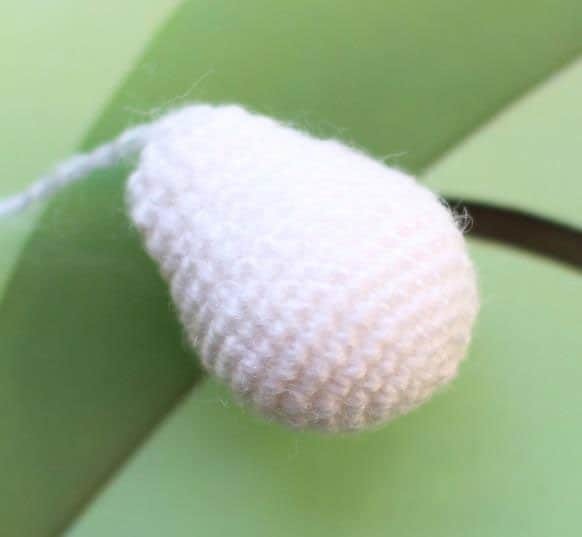 The crochet bunny is small enough to fit in your palm. 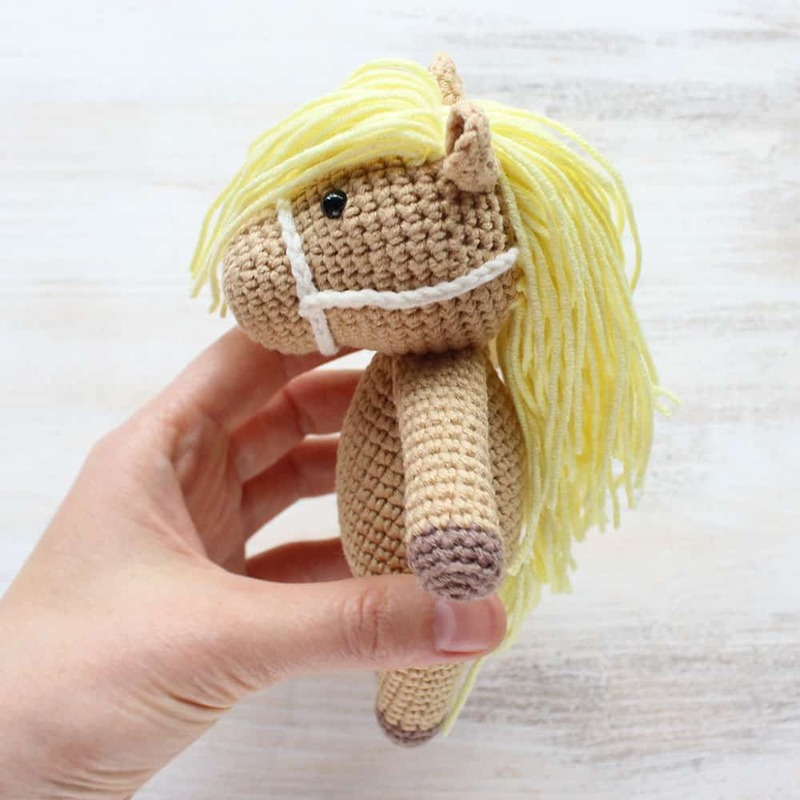 Start crocheting with a head. Stuff as you go. Rnd 19: (dec) repeat 6 times. Close the opening, fasten off and weave in the end. Rnd 2: 3 sc in the next st, 2 sc in the next 2 st, 3 sc in the next st, dec. You get a small triangle. Sew the nose and the eyes (see photo below). Fasten off leaving a tail for sewing. Don’t stuff. 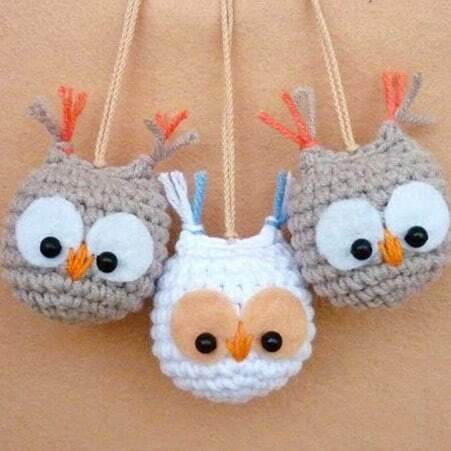 Sew the ears, embroider eyebrows and eyelids (or crochet a small chain and sew it). Give a slight tint to the cheeks. Also, you can make a few stitches under the eyes with a cream-colored thread. Thus, the eyes will be more alive. Rnd 18: (dec) repeat 6 times. Fasten off leaving a tail for sewing. Stuff. Rnd 13: (sc in the next st, dec) repeat 6 times  Stuff the leg. Rnd 14: (dec) repeat 6 times. Stuff. Close the opening. Fasten off and weave in the end. Rnd 14: (dec) repeat 5 times. Stuff. Close the opening. Fasten off and weave in the end. Rnd 6: dec repeat 6 times. Stuff. Close the opening. Fasten off leaving a tail for sewing. 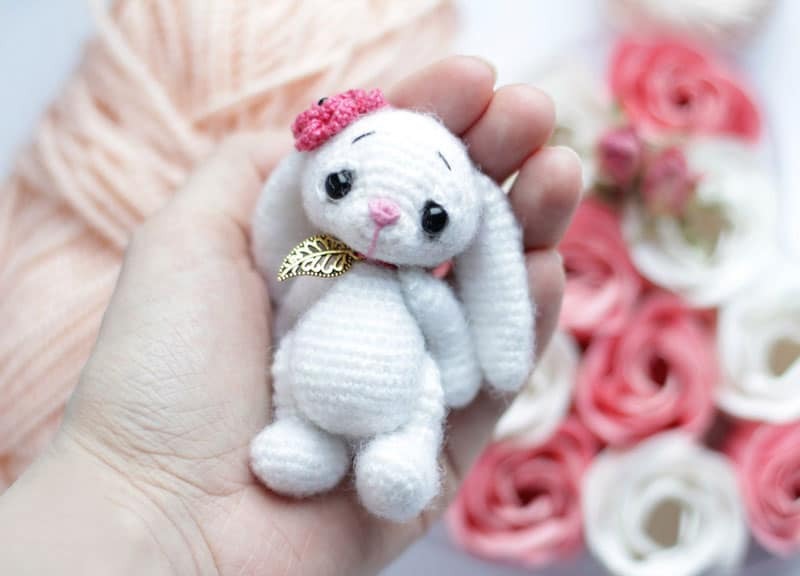 Hope you enjoyed this Crochet Bunny Amigurumi Pattern. If you have some questions concerning it please write them in comments. Todas sus explicaciones son estupendas, y con un nivel principiante-medio , se pueden tejer. Creo que algunas personas son mal educadas al hacer sus preguntas, les aconsejo que compren el patrón escrito, !es muy barato! Le agradezco su trabajo, su esfuerzo, su generosidad y su creatividad. The head instructions are very confusing? It says increase one single crochet in next two stitches? Did you mean two stitches in next two ? I love that she’s holding her own amigurumi. 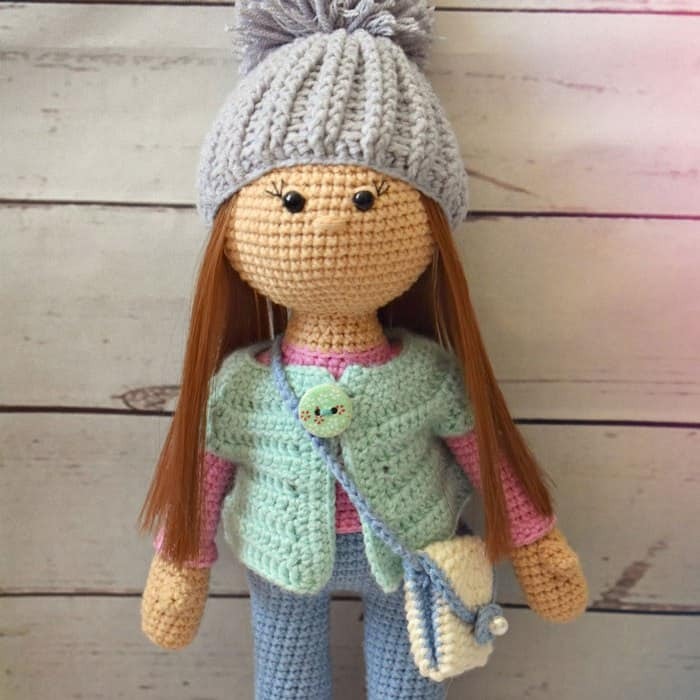 Do you have the pattern for the little bear she is holding too? I would love to make one for the bunny I make. And maybe for a few of the other animals from your patterns as well. Love this bunny soo much!😍 (Love all your crochet animals😄) But I dont grt the head/nose look like the photo. If I buy the download pattern, are there more picture how to do it? Oke thank you! Then i have to try again. Can I make these and others to sell in Maui? Can someone post pictures of the head in progress…I attempted it several times and do not get an oval shaped head that looks like the finished picture. I’ve made other amigurumis, but this one has me stumped. Made the other body parts ok, but not the head….just not in proportion. I need to se it in progress, guess I’m more visual. 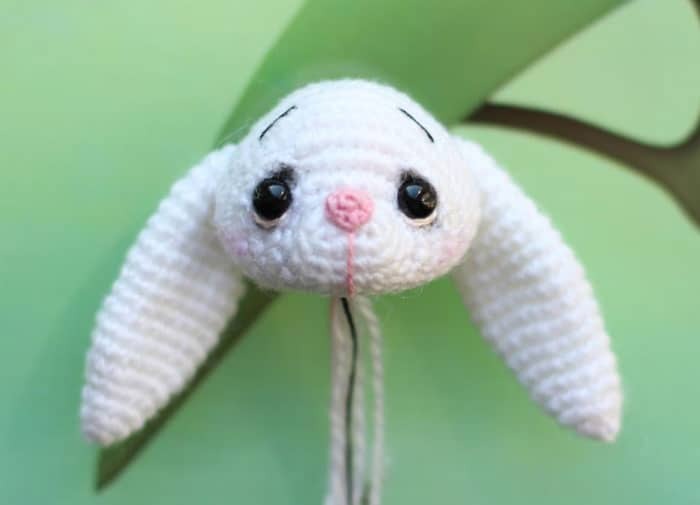 This is one of the cutest bunny patterns I’ve seen. I love the cute little eyes on them. My granddaughter would love these bunnies. 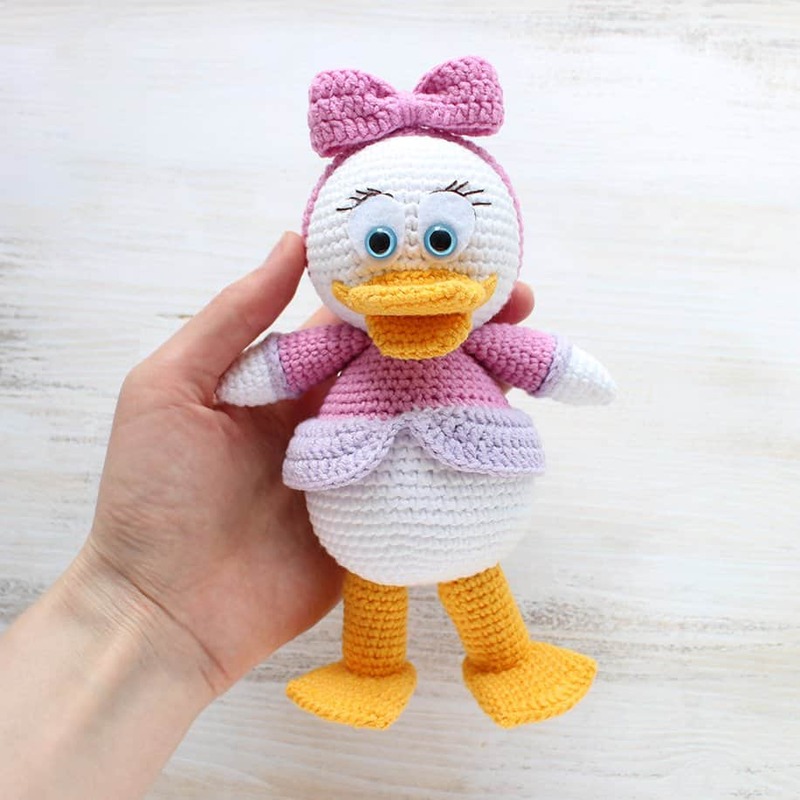 Thanks so much for sharing and making this a free pattern. tiny teddy shown on one of the pictures. How do you make the little flower on top of head? What size of buttons or eyes did you use, please and thank you? I have checked thru pattern, but didn’t see anything. How do you make the little flower on top of head? .do you have a pattern? I’m new to this. I have all the parts crocheted, but I’m not sure I know how to sew them together. Can you help me with this or point me in the right direction? Thanks in advance. I do love the little bunny. Ok on the head round 2 I just can’t get it. I only get 13 st. So how do I do these round. Please thanks. 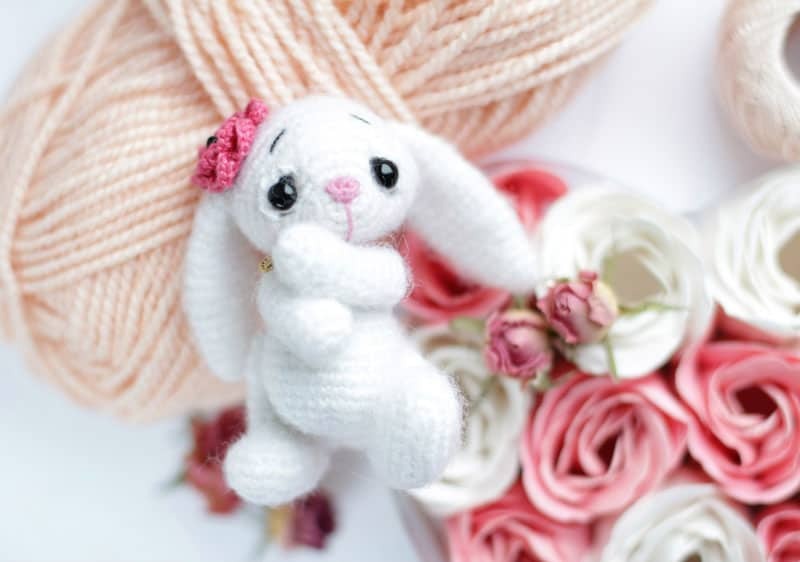 I love the little bear the bunny is carrying could you send/ post the alteration you made to the bunny pattern to make him too please? Hi, I really love this bunny but making the leg, i get the feeling that i’m doing something wrong. The rounds seem to shift too much, as the dec. On the foot are on the long side of the oval, not on the round side. Do i need to do an extra stitch or something between the rounds or can i just keep working in spirals? 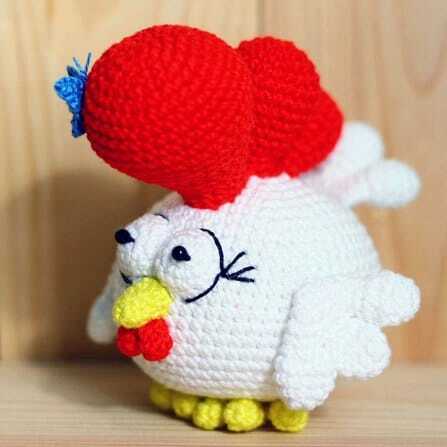 Hi Anma, the bunny’s feet are crocheted in the same way like baby shoes. 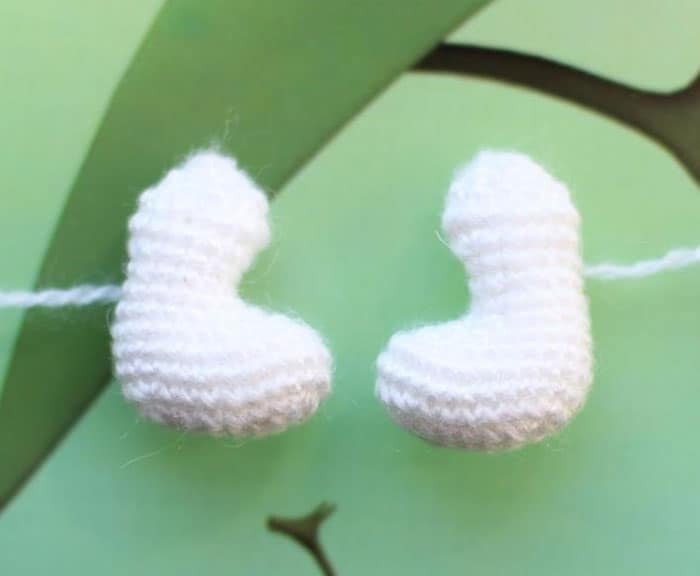 You can watch any video tutorial showing how to crochet baby shoes to understand the principle. The size is about 10 cm, but note that it depends on your yarn weight and hook size. 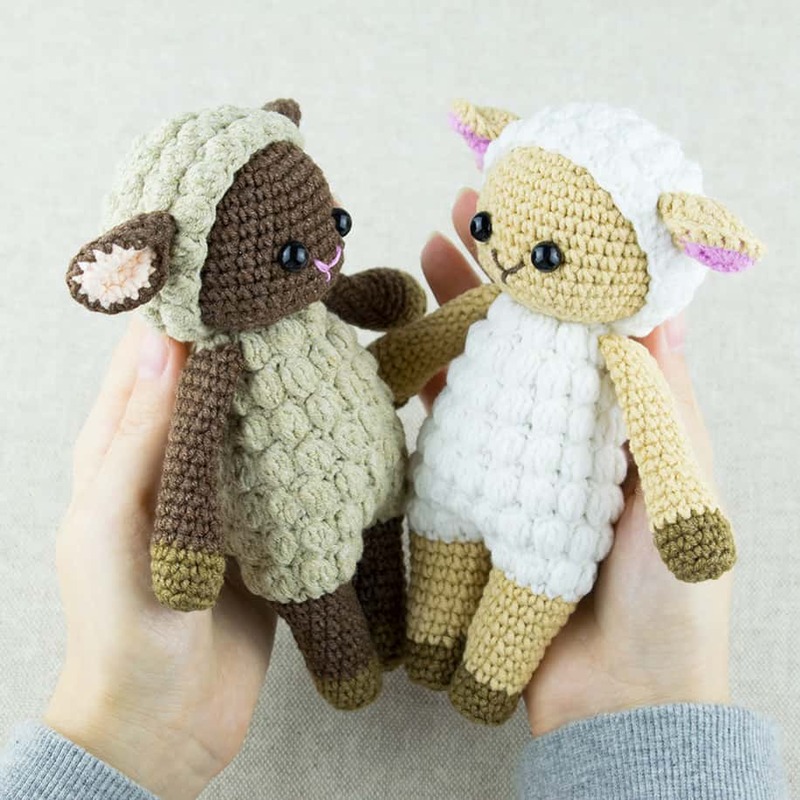 Ok I’m new to Amigurumi and confused. In round 1 of head you say join with SS. I get 10 stitches without SS. I put my marker in at beginning Inc of round 2. When I finish round 2 I’m not back to mystitch marker. I’m I supposed to be or just count stitches and not use marker??? I hope makes sense. I’ve crocheted for 50 years and I’m hoping that senility isn’t setting in. Thank you in advance. Hi Dee, when making amigurumi each following round is slightly shifting comparing to the yarn marker. So, counting stitches is essential part of the process. Oh no! Im so sorry i just re read it for a good minute and realized u only dec six times. I’m having a bit of trouble with the head and I don’t know why. Is it worked from top to bottom? 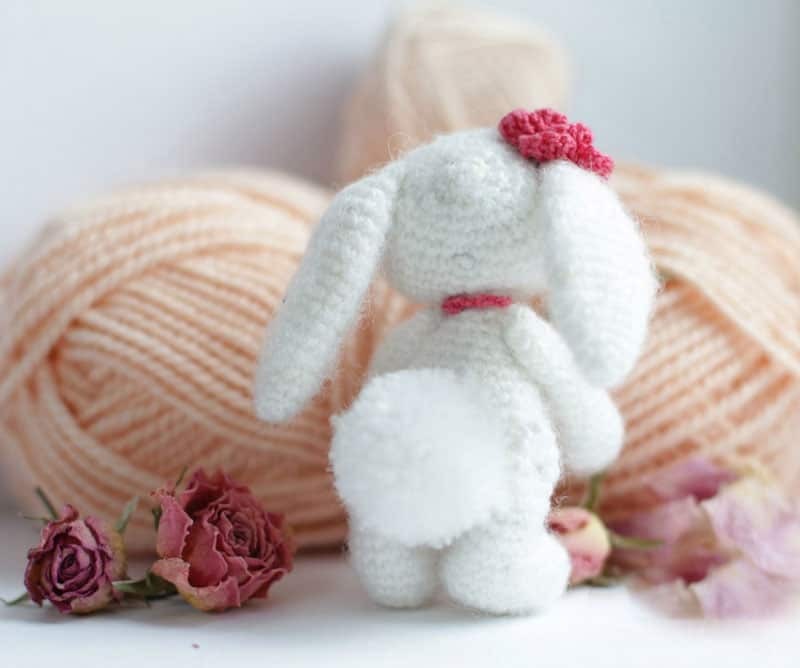 Thank you for sharing the pattern I love this little bunny. Hi Gem, the head begins from the muzzle and ends at the back side. I want to thank you for sharing your patterns. I made the Little Crochet Bunny amigurumi. It s adorable! Again – Thank You! Hi, is this pattern absolutly free ? friends of mine wants me to translate it in french but i wanna be sure i’m allowed by the personn who create the pattern…..
Hi Elodie, translation in other languages is not allowed. I haven’t never done any animals what is a magic ring.? I love these patterns but not sure how to download them. 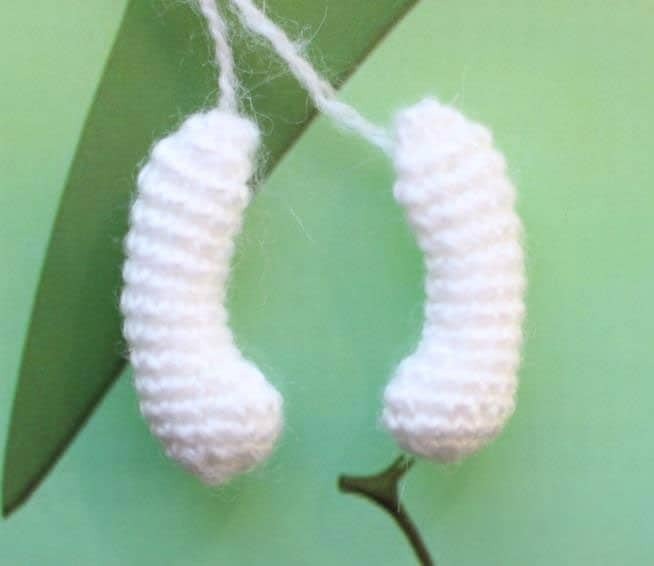 Hi Denise, it means you should crochet on both sides of chain to make an oval instead of circle (when you crochet in magic ring). Hi , can you tell me how you assemble the eyes? Did you crochet around eyes? Thank you for this lovely pattern. Hi Roya, at first you need to insert safety eyes or sew beads. Then make several stitches with sewing needle and milk thread under the eyes. Also you can embroider eyelids or crochet 5-7 chains and sew them above the eyes. Make a slight tint with the help of eyeshadow. Can you tell me if there is a pattern for the bear that she is holding? The bear is made the same way as a bunny with little modifications but with the smaller hook and thinner yarn. Hi Maria, thanks a lot for your message. I updated the pattern, there was a mistake in Rnd 5. Now it is correct. Hi Doaa, the total number of stitches of the Rnd 5 of the head is 20. You need to make increase 4 times in the Rnd 5.